Nothing quite says I’ve been romping around outdoors like a good bit of blush. I loves the stuff, and I love how it makes your face look all sleek and finished and more defined. As of lately, I have been dark lip obsessed, and my usual peachy pink blushes haven’t been cutting ze mustard… peach blush and dark red/purple lips looks off, at least on me. I just love matching the tones of blush and lipstick – it’s a tip I learnt from Sali Hughes (what a babe!) – and it makes your makeup come together and look a lot more legit. Tarte Exposed – The elusive tarte blush is one of those beauty blogger must-haves. It is worth tracking down from Sephora, because the Tarte blushes are very nice. They’re crazily pigmented but also really soft and blendable. Benefit Rockateur – so much sheeny goodness. A rose gold delicious kind of shade, the blushes are the best offering from Benefit in my opinion. This one is the shimmer-iest, but the glow it gives makes your skin look all healthy and nice. NARS Sin – the old favourite that comes out every Autumn and Winter. It looks all purpley, but with a big fluffy blush brush it doesn’t make you look bruised. It just goes so so well with purple lipsticks, and it is the classic NARS formula – awesome. Kevyn Aucoin Liquifuchsia – such a bright pink that looks really intimidating, but it’s so creamy and it blends in so smoothly and looks all creamy and dewy and lush. I always blend it in with a Real Techniques expert face brush, and the colour doesn’t look anywhere near as scary. I do loves a cream blush as well. Any of the creamy blushes are amazing and should be checked out. NARS Douceur – the one that goes with pretty much any makeup look and is fool-proof. I just sweep it on (I didn’t even look this morning, oops. I was watching American Horror story and didn’t want to have to concentrate on things like looking in a mirror) and it’s never too much, but it still adds a certain something special. 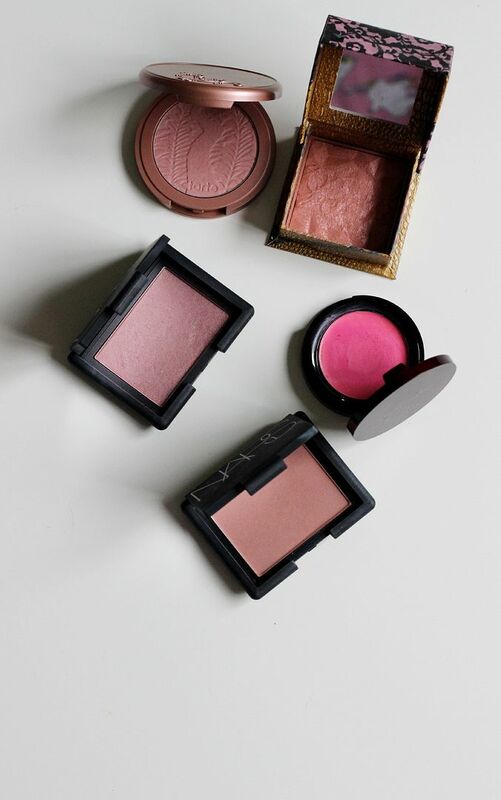 What blush do you like to wear at this time of year?